It's cliche, but what a difference a year makes. We started 2018 with a very bullish market for metals and mining stocks. The euphoria, however, was short lived with the market starting to roll over in February with another leg down starting in July and a horrendous December. In fact, the major US indices recorded their worst December since the Great Depression. The Chinese Zodiac calendar had 2018 as the year of the Dog. In hindsight, I'd say that was pretty apt. RIP 2018! Lo and behold, the year of the Pig has the best stock market returns of all 12 zodiac animals (the worst is the Year of the Snake with an average 0.6% return, so make sure you're in cash for 2025). Let us hope that the streak continues and that we can all be pigs this year. Given the macro economic backdrop, just be careful that you don't get slaughtered. In large part, the December drop was triggered by treasury yields and the Fed. The global economy is clearly slowing and the US Fed is raising rates. Jeez, that is not entirely shocking when we are 10 years into an economic expansion. To me, the market drop was not warranted by the data. Without boring you with a ton of detail and charts (check out the Fat Pitch blog for some great charts and analysis), the facts are that interest rates remain low by historical standards even though the labor market is tight. We are not seeing massive wage inflation and an overheating economy that necessitates rapid rate hikes. Major economies continue to grow, albeit at a slower pace (3.5% in 2019 vs 4.0% in 2018). Corporate balance sheets are generally quite healthy, earnings are continuing to grow, and valuations are reasonable. 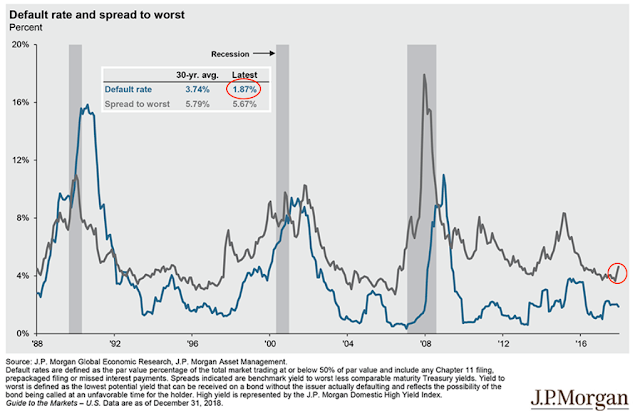 Default rates remain low and high yield spreads have not blown out. All things considered, that is a pretty Goldilocks scenario. In simple terms, we are NOT in a recession (yet). While the probability of a US recession is trending up, the treasury spread is currently indicating only a 21% probability in the next 12 months. But, if treasury spreads continue to widen, then seems to be just a matter of time before the US is in recession. If consumers and investors become convinced that a recession is looming, it is effectively a self-fulfilling prophecy and a recession will happen. The other important concept to remember is that stock markets are forward looking. Values today reflect what the market is expecting to happen. So, even if we are not in a recession today, valuations will be negatively impacted if investors collectively believe that is where we are headed. 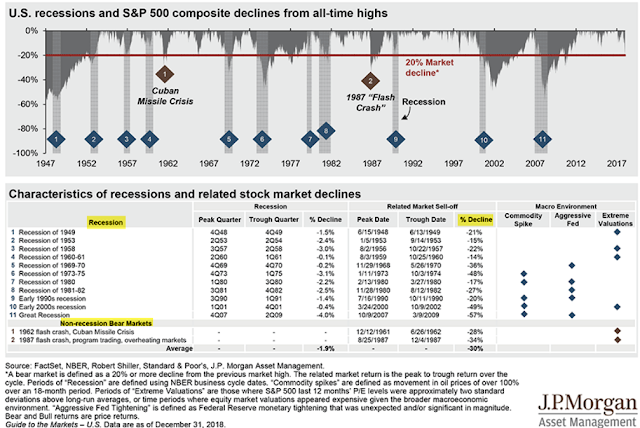 The December market crash potentially set up an opportunity that we only see every couple of decades: a 20% market decline when the economy is not in a recession. At the very least, it set up a tradeable rally that we have seen rapidly develop over the past two weeks. I added significant equity exposure in December, but I'm now starting to fade the subsequent rally. 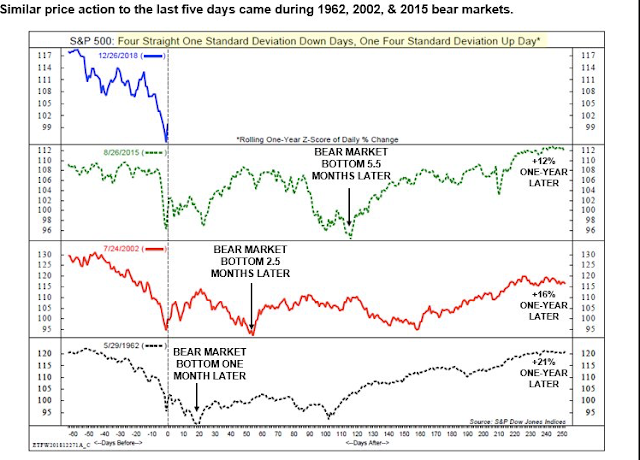 With props to the Fat Pitch blog again for their great chart collection, the chart below shows how the S&P 500 behaved in the three prior instances when that index experienced three one standard deviation down days followed by a four standard deviation up day (which occurred on Dec. 26, 2018). In each one of these rare instances, the market as between 12% and 21% a year later. BUT, in each of those instances, the S&P 500 also retested the lows anywhere from one month to 5.5 months after the four standard deviation up day. If history is a guide, then December's drop was a buying opportunity, either as a buy and hold event or by waiting and buying if the market retests the December bottom. 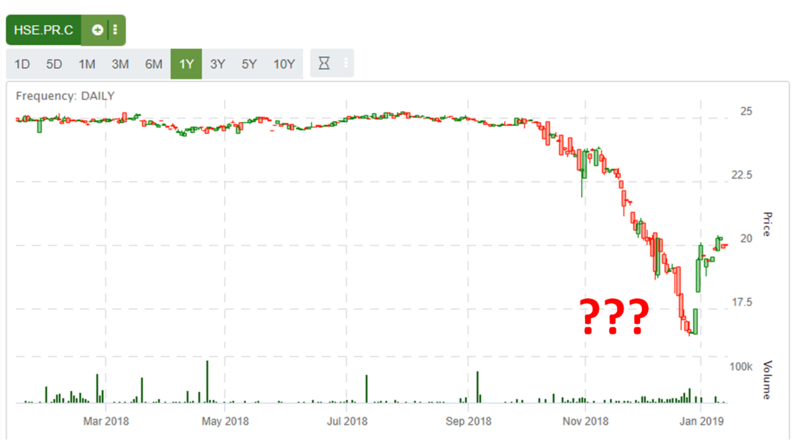 For those who want to be pigs, you could view the bounce off the December lows a tradeable rally, then sell the rally and buy again on a double bottom. That, of course, is assuming that history repeats itself. At the market lows, valuations did indeed look very compelling with the S&P 500 at a forward P/E of 14.4. Canadian valuations were even more compelling at roughly 13x, about 1.6 standard deviations below the long-term average. Assuming a recession isn't right around the corner, that suggested 10% upside simply based on mean reversion. 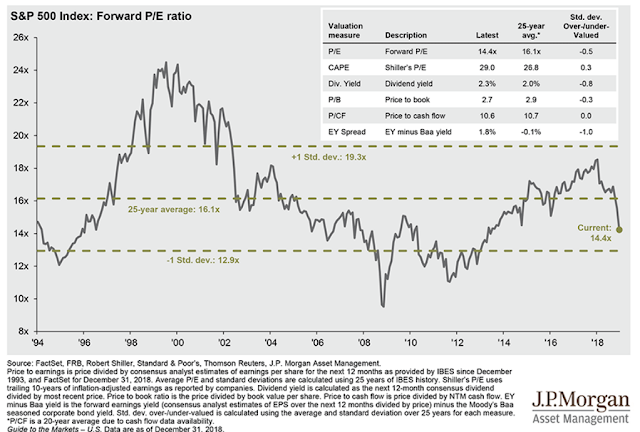 But, as can be seen from the chart below, P/E valuations tend to trend and the recent uptrend in valuation is broken. While 14.4 is inexpensive, you will still lose money in the near term if we are on our way to a P/E ratio of, say, 10 like we did in the last downturn. My view is that the current situation may be similar to the situation in 2006. The economy is not yet in a recession, but growth is slowing and valuations have likely peaked for now. Simply buying the market dips, a very lucrative strategy for the US market for the past 10 years, is likely not to bear fruit any more. Now, sector and stock selection are likely to have a greater influence on returns. Knowing what part of the market cycle we are in is tremendously important for market positioning and gains if you are not a passive investor. I came across the chart below a few years ago and I set it as my computer wallpaper. 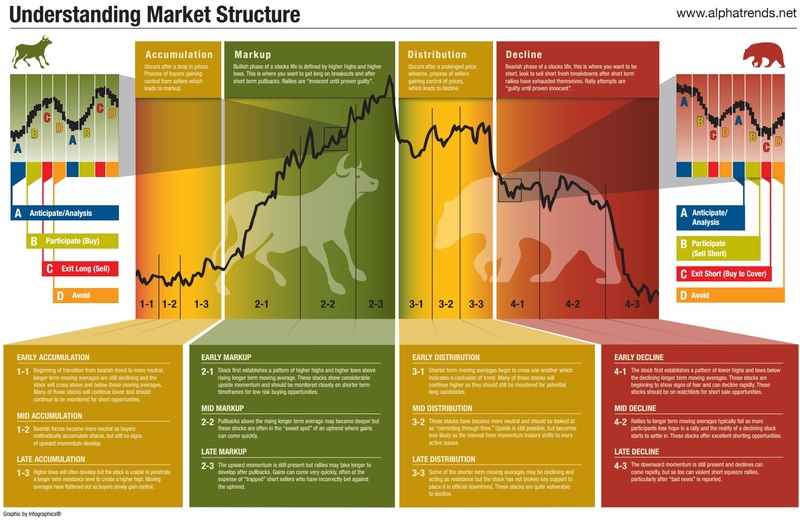 Market cycles play out over many years, so this graphic reminds me to periodically assess where we are in the cycle. In a nutshell, my goal is to take risks during Accumulation and Markup, but then preserve capital when we get into or close to the Decline phase. The challenge with the Market Structure graphic is that the patterns are obvious in hindsight but not in the moment. Given recent market activity, it seems to me like we are currently in the Late Markup stage or the Early Distribution stage. December may have marked the transition period from Markup to Distribution. But what if that is not the case and we are still in the Mid Markup stage? Getting defensive too early can mean missing out on big gains that typically take place during the Late Markup stage. This is why we look to data and trends, as well as historical behavior, for clues and to be nimble so that you can react. My assessment is that we have entered the Distribution stage. While that suggests the market top is in, it would not surprise me to see the S&P 500 test the top end of the range. I added significant equity exposure in the December drop, but I tried to do so in a way whereby I was positioned for compelling upside while not exposing myself to massive downside. With my involvement with junior mining companies, I have plenty of exposure to high risk, high reward stocks. I also wanted to diversify more beyond mining, especially given that I had previously positioned myself for a bounce in copper stocks. Ooops! One of the purchases I made in December was Vermillion Energy (TSX: VET) and I like this trade. Vermillion is a diversified energy company with low Canadian exposure, so hasn't been as hard hit as Canadian oil & gas producers from the political pipeline debacle in Canada. On top of that, it pays a healthy dividend (currently 8.7% and 9.7% at my cost) that looks sustainable. Vermillion was the baby being thrown out with the bath water in December and I bought some at an average price of $28.37. I'm up 13% on the trade so far, but I just sold April 2019 covered calls at $34 for $1.50. If the market recovery continues, my shares will get called away by April and my return will be 25% plus monthly dividends. Not a bad pass for four months! On the flip side, if the market takes a turn for the worse, I now won't lose money on the trade unless it goes below $26.87 due to the premiums I received for selling the covered calls. This is what I like - good return potential with moderate downside risk. I also bought some preferred shares that are up nicely because pref investors seem to periodically do stupid things with instruments that are fairly illiquid. Going back to my bad copper trade, I sold my Turquoise Hill (TSX: TRQ) for a tax loss in December. One thing that diminished my view on TRQ is that I heard Rio Tinto really screwed up building Shaft 2. The shaft screw up might be worse than announced, which would be an expensive mistake that will cost TRQ and may delay a strategic move by Rio Tinto to acquire 100% of the massive Oyu Tolgoi project. I still like the low valuation on TRQ and will consider putting a position back on in the future. For now, I took the proceeds from TRQ and bought First Quantum (TSX: FM), as its Cobre Panama build seems to be going well and the stock has much better liquidity than TRQ. I still like copper fundamentals, but there are major short-term headwinds due to concerns over China slowing. Consequently, this stock has barely bounced since last month's market bottom and it is reminding me how long-term fundamentals are often not synonymous with short-term gains when it comes to stocks. However, it is hard to give up on the trade as a resolution in the China-US trade war, more China stimulus, or further weakening could all benefit copper. I also find the First Quantum chart interesting from a technical perspective. Will support at $10 hold, leading to a bullish breakout? The descending triangle pattern suggests we will know soon. If support breaks, whether due to company-specific factors or macro factors, FM could easily drop to $8 or lower. On the flip side, if the situation becomes more bullish FM could easily move back up to $16 or $18. Conceptually, I like the upside potential versus the downside risk, but this failed copper trade is testing my patience. 2019 is off to an interesting start and I suspect it will be an interesting year. I think my mantra for the year is be a pig, but don't get slaughtered. 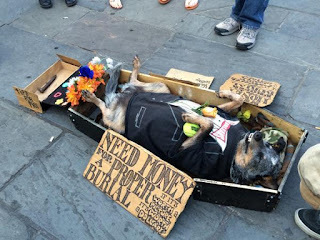 Disclaimer: This is a free blog with my thoughts and opinions. Do not construe it as investment advice. Consult your broker and do your own due diligence. Markets don't like uncertainty because uncertainty equals risk. For this reason and US dollar strength, we've seen metal prices plummet over the past few months. This uncertainty stems from the escalating trade war situation between the US and China, the big fat pig with an insatiable appetite when it comes to metals consumption. Ironically, despite the recent metal price weakness, large mining companies have never been so eager to acquire large new copper assets. Lundin (TSX: LUN) is still looking to acquire copper assets, after it lost Nevsun (TSX: NSU) to Zijin. BHP (ASX: BHP) just acquired a 6.1% equity stake in SolGold (LSE: SOLG), which is advancing a big copper porphyry discovery in Ecuador. 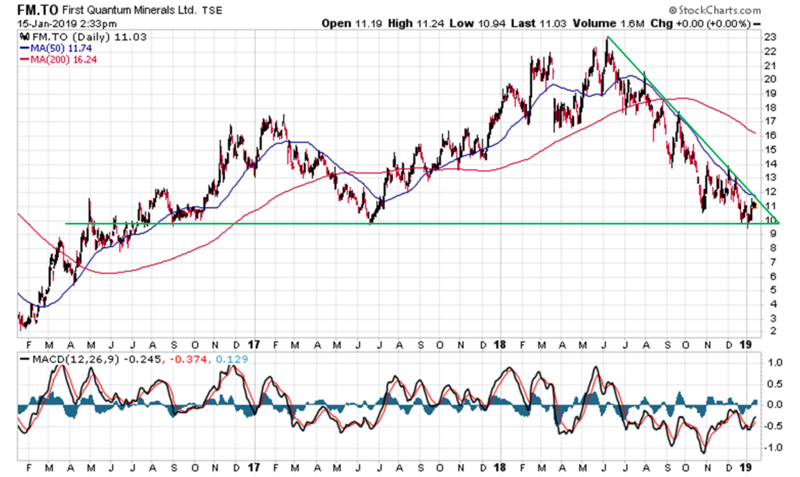 Garibaldi (TSXV: GGI) created lots of hype last year by making insinuations that they had discovered a new nickel deposit that could rival Voisey's Bay. Eric Sprott was a believer and validated the story, so lots of investors bought into GGI, resulting in a market cap north of $300 million. An impressive feat given the recent state of the mining sector! 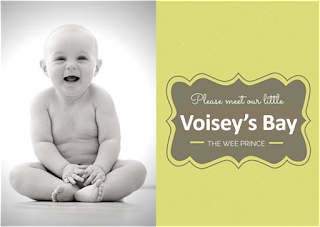 Based on the latest drilling, I congratulate Garibaldi on the birth of baby Voisey. Aww, it's so small and cute! Dr. Peter Lightfoot must be a proud papa. I was at the Precious Summit last week, so I wasn't keeping a close eye on the market. I saw the news that Aurion Resources (TSXV: AU) finally found the potential source of the gold boulders in Finland. Hole AM18042 drilled intercepted 0.65 metres grading 3,510 g/t gold (or, if you like your results smeared a bit, then it was 2.90 metres grading 789 g/t gold of which 2.25 metres was only 3.0 g/t gold). That is a whopper of a gold intercept, although it seems like they are looking for needles in haystacks.